Set based – Java, SQL and jOOQ. At a customer site, I recently refactored a “slow-by-slow” PL/SQL loop and turned that into an efficient set based UPDATE statement saving many lines of code and running much faster. In this blog post, I will show how that can be done. The blog post will focus on Oracle and UPDATE, but rest assured, this technique can be implemented in other databases too, and also with other DML statements, such as INSERT, DELETE, and depending on the vendor, even MERGE. So, there were certain records belonging to some category, and there’s a counter indicating how often each record has been encountered in some system. Wonderful. What’s wrong with this? The logic is straightforward and runs quite quickly. Until you run this many many many times per second – then it suddenly starts to hurt. Whenever you work with RDBMS, try to think in terms of data sets and try running a bulk operation on such a data set. (Exceptions exist, see caveats below). 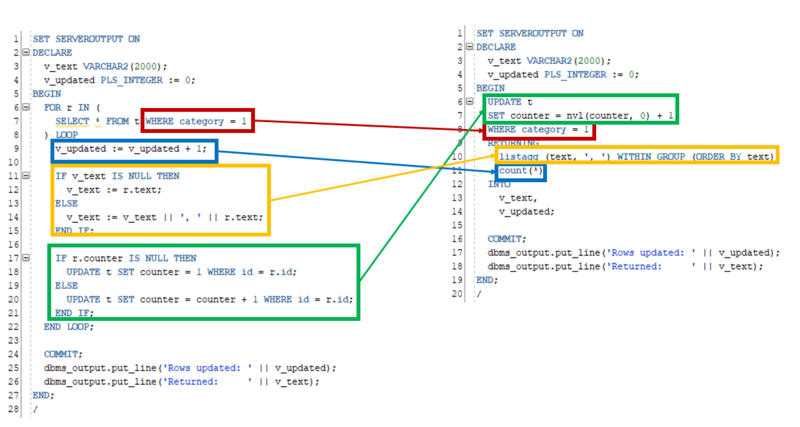 The modification of the data can be written in a single SQL statement, instead of updating the same table many times. In the PL/SQL version, this predicate is a simple access predicate for the SELECT statement, over whose implicit cursor we’re iterating. In the set based SQL version, that predicate has been moved into the single bulk UPDATE statement. Thus: we’re modifying the exact same set of rows. Before, we had a count variable that counted the number of iterations over the implicit cursor. Now, we can simply count the number of rows being updated in the bulk update statement, conveniently in the RETURNING clause. An alternative (in Oracle) would have been to use SQL%ROWCOUNT, which is available for free after a single bulk UPDATE statement. The requirement was to concatenate all the texts which are being updated. In the “slow-by-slow” PL/SQL approach, we’re again keeping around a local variable and concatenate new values to it, doing some NULL handling, initially. In the set based SQL version, we can simply use LISTAGG() in the RETURNING clause. Notice, there seems to be a bug with this usage of LISTAGG. The ORDER BY clause has no effect. In the “slow-by-slow” version, we run 1 UPDATE statement per row, which can turn out to be devastating, if we’re updating a lot of rows. Besides, in this particular case, the developer(s) have been unaware of the possibility of NULL handling using NVL() (or COALESCE() or similar). There is really only one UPDATE statement necessary here. That already looks a lot neater. As always, I’m not publishing actual benchmark times, but relative times compared to the fastest run. The set based approach is consistently 2.5x faster on my machine (Oracle 18c on Docker on Windows 10 / SSD). This is updating 6 rows per execution. At this point, no one needs to be convinced anymore that a set based approach is much better for updating your data than a row-by-row approach in a language like PL/SQL or Java, etc. Bulk updates are much better than row-by-row (remember: “slow-by-slow”) updates, regardless if you’re using PL/SQL or Java or whatever client language. This is because the optimiser can plan the update much more efficiently when it knows which rows will be updated in bulk, rather than seeing each individual row update afresh, not being able to plan ahead for the remaining number of updates. However, in situations where a lot of other processes are reading the same data while you’re bulk updating them, you need to be more careful. In such cases, a bulk update can cause trouble keeping locks and log files busy while you’re updating and while the other processes need to access the data prior to your update. One size never fits all, but at least, in every situation where you loop over a result set to update some data (or fetch additional data), ask yourself: Could I have written that logic in a single SQL statement? The answer is very often: Yes.